I went to BYU in Provo (furthest I could get away from home and still afford school). During my Junior year, Tony Davis (class of 97) caught up with me in Provo. 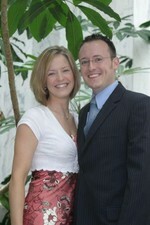 We got married in Aug 2002 and I graduated from the nursing program in 2004. I work at the University of Utah Hospital as a VAD Coordinator taking care of patients with artificial hearts. Tony is a martial arts instructor with his own studio. Bought a house in North Salt Lake, traveled, and then started our small family with the arrival of Landon in Sept 2010. Erin Shannon Davis has a birthday today. Little Sis Lindsay, Little Bro Kyle, and me being silly at Lagoon. Tony's "Dragon Wagon" Scion. Our billboard for the karate studio!